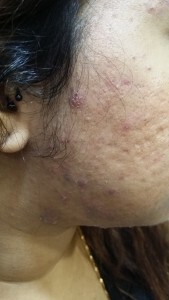 Acne is very common in Singapore. It affects people of all races and ages, mainly adolescents and young adults. It tends to appear on face, back, chest, shoulders and neck. Although not dangerous, acne can cause scarring if not properly treated. Acne can be caused and contributed by a few things. When you turn adolescent, change in your hormone level may cause excessive oil production in your skin and predispose your skin to infection by bacteria. Genetics play an important role too. If your close relatives have acne problems, you may be more prone to acne too. Some medical conditions that cause excessive male hormone production can cause acne problems. Certain anabolic steroids body builders use, or traditional medicine that contains male hormones may also contribute to acne. In women, hormonal changes around the monthly period may cause a flare-up. Most make-up does not affect acne. However, greasy or thick make-up may cause acne to worsen. Contrary to common beliefs, squeezing or picking the spots may actually make them worse and cause scarring. Certain types of oral contraceptive pills and prescribed medications may make acne worse. Please consult your doctor if you are concerned. Get your acne treated early. It is usually treatable but it takes time and patience. It does not go away in days! It may take up to several months, and you may later need maintenance treatment for several years. It is also important to have one doctor looking after your acne so the progress of the treatment can be monitored closely. Remember that if it is not treated properly, it may cause scarring. The aim of ance treatment is to clear spots as much as possible and to prevent scarring. It usually depends on the severity of the acne. Treatment can be topical (treatment that you apply to your skin) and/or tablets, as well as by injections or lasers. Topical treatment is usually suitable for mild acne. The products that are typically used are benzoyl peroxide, retinoids, azelaic acid, topical antibiotics and combinations. In more severe acne, a combination of topical and tablets are usually used. Tablets that can treat acne include antibiotics, combined oral contraceptive pills and isotretinoin tablets. For a pimple that is very big and swollen, a small injection can be given directly into a pimple to speed up the healing process and minimize scarring. It is a very simple procedure with minimal risks that can be performed on the same day you see a doctor. Certain types of laser treatment can also be used in treating acne in the right group of people. Treatment for acne can take a long time. Do not give up if your acne does not improve in a couple of weeks. You should persist with the treatment to see the best results. Please consult a doctor early to get a proper assessment of the severity of your acne and the type of treatment suitable for you. Do not get discouraged by slow response to treatment. It takes time and patience for acne to get treated! Contrary to popular belief, stress does not cause acne. However, change in hormonal level during stress or anxiety may contribute to worsening acne. Poor hygiene does not cause acne too. In fact, excessive washing may make acne worse! Acne is also not directly related to food or water intake. Be very careful of the makeup you apply because oil based facial products such as moisturizing cream can make your acne worse. Some people will tell you that medical treatment is ineffective for acne. This is not true! Treatment usually works well if used properly. Dr Sii Sik Liong is a very experienced doctor in clinical and aesthetic Dermatology, and has practised in different hospitals in Singapore and the UK for many years.